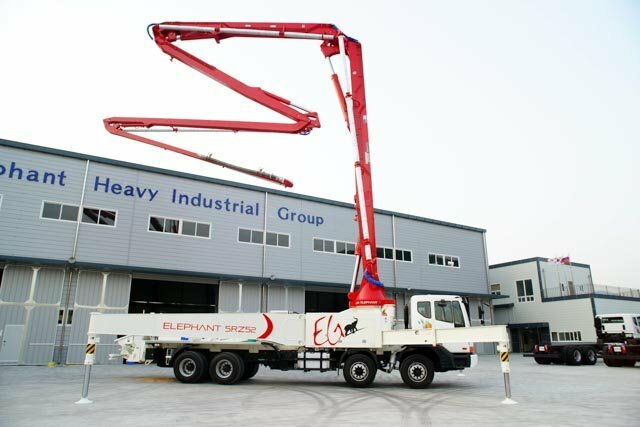 Korea Motors(Hankook Motors) is official distributor of truck mounted concrete pumps Elephant. In the present Elephant concrete pumps are exported to the CIS countries. We always look forward for the partnership in other countries and would like to have dealers in every region. The model line is consist of several boom pumps: 4RX40, 5RZ52 and 5RZ56. - Wear plate and wear ring: Tungsten carbide. We supply Elephant concrete pumps to the CIS countries so to prevent freezing of concrete all our pump cars are equipped with independent water tank heating system and booms are wrapped in isolating sleeves. Elephant pump car upper platform is covered with aluminum anti slippery surface. Elephant pump cars have also manual lubrication system for boom and concrete system. Concrete Cylinder Diameter 230mm 9"
Hopper Capacity 600L 23ft cub.